Long time no Monday Style Prompt. I had lots of fun last year with the style prompts – tried some new things, explored different style personalities, avoided falling into a style rut, had some good excuses to go thrifting!! This year (and by year I mean September to June), I’m moving things to Tuesday for the Tuesday Try! I almost called it the Tuesday Trend then decided that for the everyday woman, “trends” might be something we’re not interested in. We want style, which may or may not include trends. However, we often need a little style nudge so I’m hoping the Tuesday Try will be a fun way to express and explore personal style! Check out my Tuesday Try Pinterest board for weekly inspiration on the Tuesday Try! 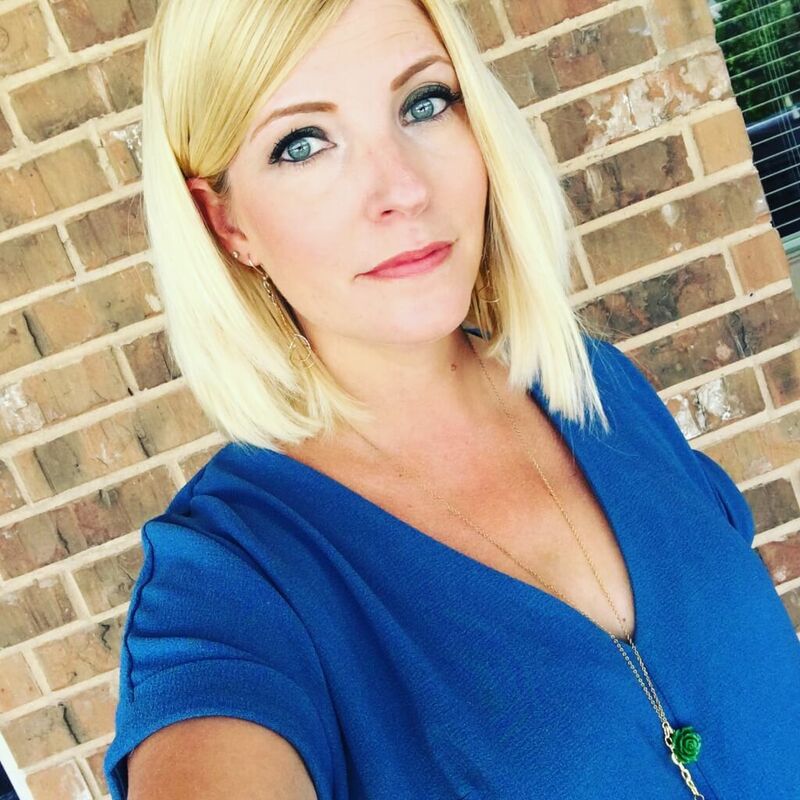 As with the Monday Style Prompt, I will issue a prompt on the weekend on Facebook which gives you some time to browse your closet and/or go thrifting (you’re welcome in advance), AND you will be able to hit the Monday sale days! The prompt might be a trend, a colour combo, a style personality – I’m open to suggestions too! 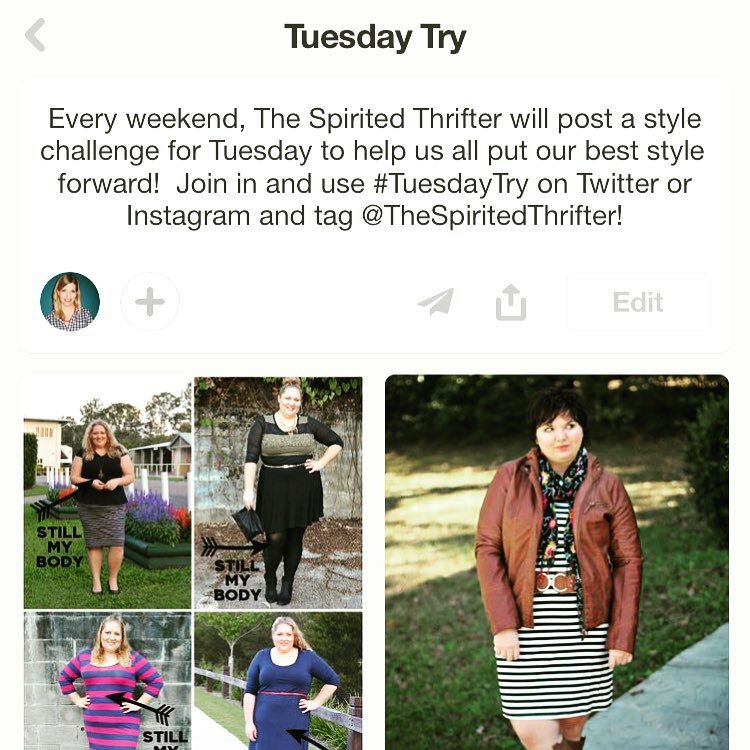 Give the prompt a try on Tuesday and tag me on Instagram @thespiritedthrifter, Twittter @SpiritedThriftr or Facebook (The Spirited Thrifter) and use the hashtag #TuesdayTry. It will be like choosing your outfits with your sister or best friend – more fun together! 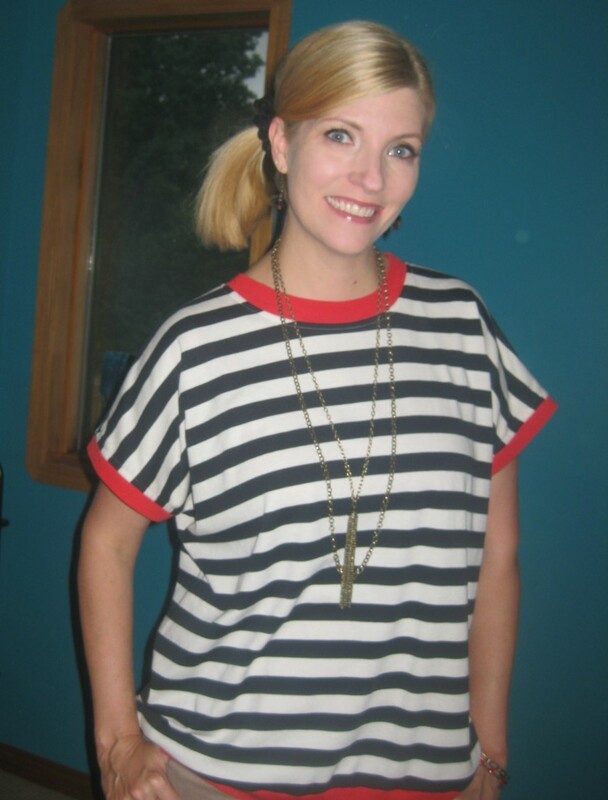 This week’s Tuesday Try was HORIZONTAL STRIPES. 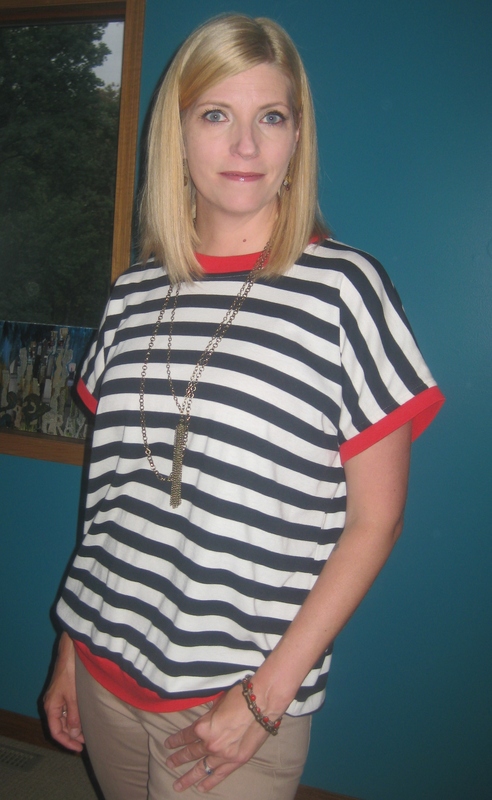 Stripes are a staple for many yet there are still women out there who believe they can’t wear them or that stripes make you look fat. TOTALLY NOT TRUE. Stripes are awesome. They are forgiving, chic and the default print that looks good with every other print. Stripes look good with jeans or under a suit jacket. They are classic for the office or hockey rink (that’s me gearing up to be a hockey mom). 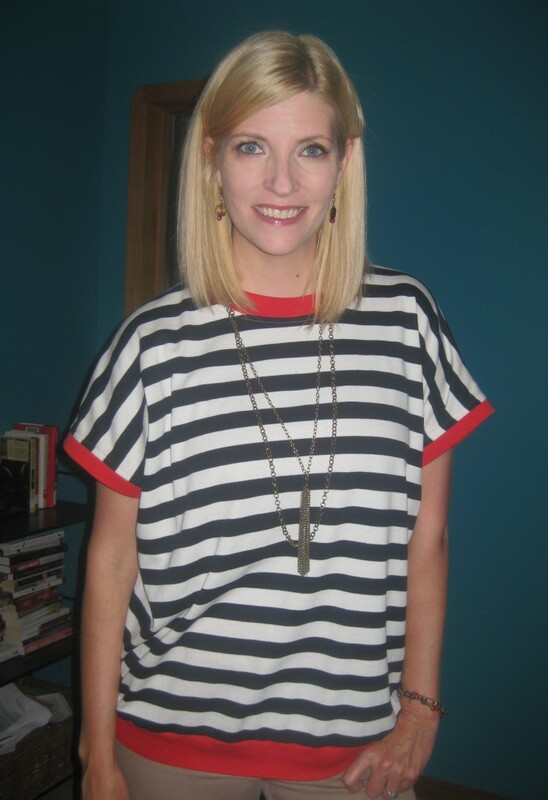 I’m going to be bold here and declare that every wardrobe needs some horizontal stripes. 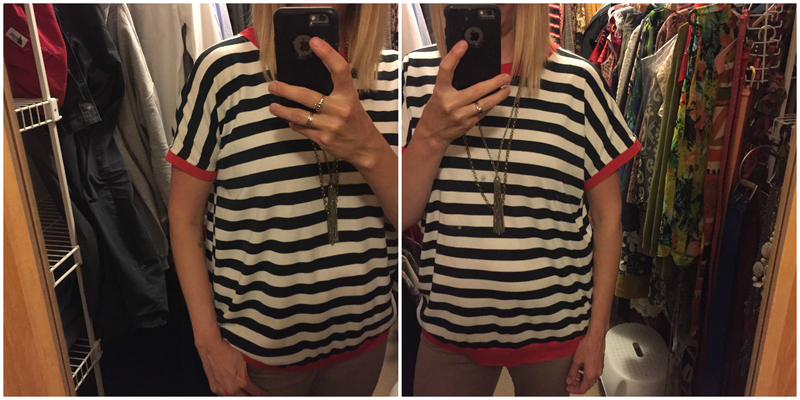 I have a collection of striped pieces, but that doesn’t stop me from buying more! 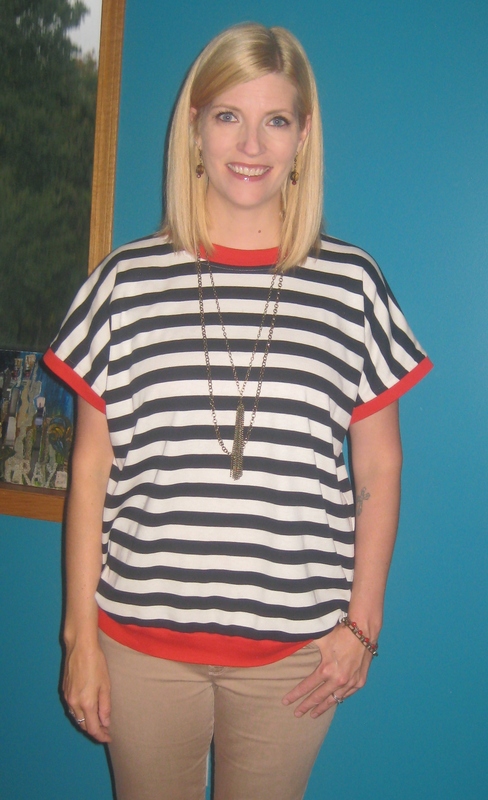 For the inaugural Tuesday Try, I took my most recent striped acquisition out for the day! 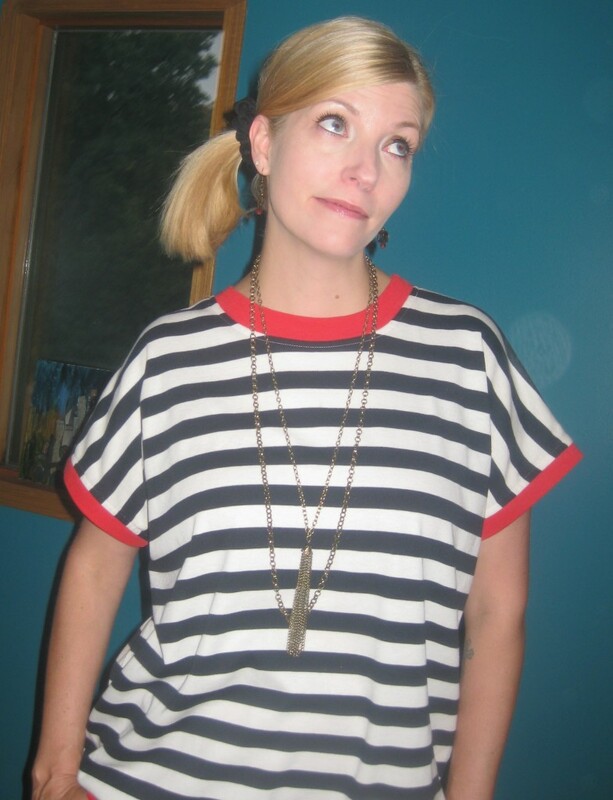 My retro top from Magpie in Portland. I can’t remember if this vintage top was from the 80’s or 90’s according to the Magpie tag but either way, that means I’m old enough to be vintage. 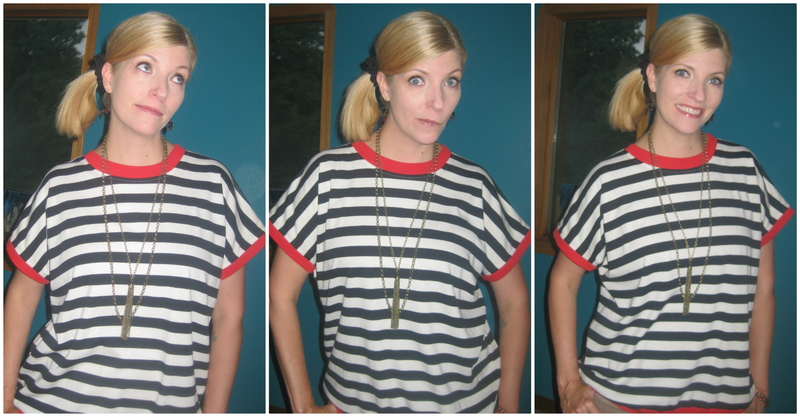 Since I *am* vintage, that earns me the right to be annoyed by 20-year-olds squealing about vintage clothes, right? Just kidding. (Not really.) Leather boots $7. Stripes are a neutral which means you can mix and match them with everything, including other neutrals like these $4 pants. The zipper on the pants is what inspired my accessories. Necklace from a school fundraiser, She Does Create earrings, and bracelets from my collection. Left is pinned, right is not. Then I thought, go retro or go home. If you love stripes like me, I hope you tried something new today, such as mixing striped pieces like Shannon or mixing prints like Sara. 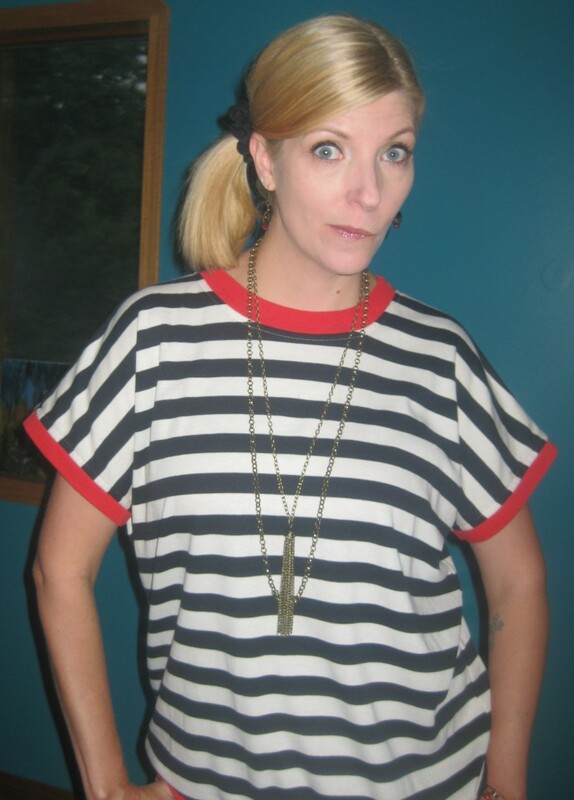 And if you are iffy on stripes, I hope your mind was changed today! Stay tuned on Facebook this weekend to learn next week’s Tuesday Try! Thanks for playing along! Wait! Before you click away, one last exciting thing to share! Seen and Heard YEG featured yours truly on podcast last week and I am quite pleased how it turned out! Thanks Karen Unland for having me – so much fun! Karen curates the best of Edmonton social media content every week and it is AWESOME! Sign up for the Seen and Heard newsletter and subscribe to the podcast and give mine a listen! Will she or will she not make inappropriate vodka jokes!? You’ll have to listen to find out! Bahaha! I was going to comment about the scrunchie until i saw your comment Nicole! Too funny! I loved scrunchies!! I love the scrunchie!! With enough vodka anything is possible! And really, aren’t those easy-on-your-hair fabric ties just the new generation of scrunchies anyway?